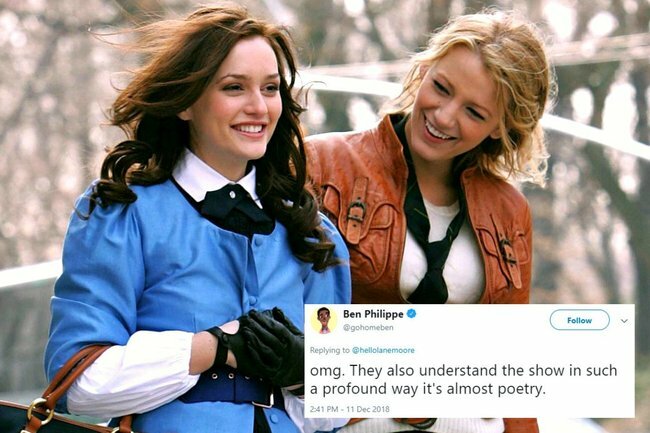 Netflix's very blunt description of Gossip Girl has got Twitter laughing. A fan has just noticed Netflix's savage description of Gossip Girl... and it's not wrong. When it comes to describing the television show responsible for detailing the lives of Manhattan’s elite – we’re obviously talking about Gossip Girl – US Netflix has managed to do it in just 14 words. A brutally honest and succinct summary of the 121-series episode, yes, and they aren’t wrong in the slightest. However, since comedian, Lane Moore, made the observation on Twitter, nearly 900 fans have shared their memories of the debaucherous teen series, famed as much for their problematic story lines as it was for their designer fashion and love of headbands. omg. They also understand the show in such a profound way it’s almost poetry. Eventually the overlords at Netflix HQ even responded to the viral Twitter thread themselves, with an amusingly definitive and curt tweet. 1. Everybody loves Gossip Girl. 2. Where is the lie tho? Now, can someone please give their social media producer and copy writer an award. What do you think about the description? Fair call or a bit harsh? Tell us in comment. Calling all mums who want to treat themselves. Take our quick survey for your chance to score one of three $100 vouchers.